You’ve taken the trouble to mount your GoPro action cam for recording your daredevil feats. Now, the company has made it even easier to share them with your awestruck friends and family. GoPro has added a new video Trim and Share feature to its mobile app for iOS and Android, as well as some of its camera models, that will let you extract short clips from your footage to instantly share. The feature is available now in the newest version of the mobile app, and comes as a firmware upgrade to the HERO4 Black with LCD BacPac, HERO4 Silver, and HERO+ LCD, cameras. Press the new Trim icon in playback mode and select the 5, 15, or 30-second playback option. 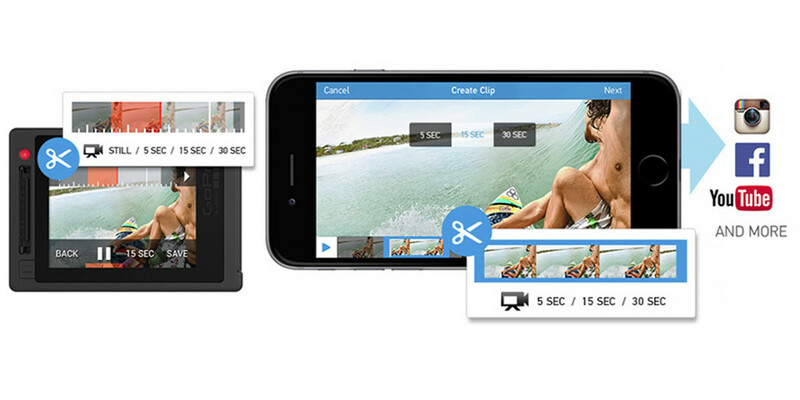 That portion of the footage will be extracted and saved to your Camera Roll or to the camera’s media card. Once your trimmed file is created, use the smartphone app to share it to Instagram and other social networks. No worries about the longer original video: It stays intact. The updated mobile app is available now. Your mobile device must be running iOS 8 or higher or Android 4.3 or higher to use the new feature.